We were leading a blissful life till last year, unaware of anything green or how much carbon footprint we had. I had put in an application to upgrade the load of my incoming electrical line from the Utility to take care of future air-conditioning requirements. The electrical utility (WBSEDCL in my case) upgraded us to a three phase line last year with a load of 8+ KVA and we were very happy unaware of the shock that 440v 3-phase line can bring upon us. We literally were shocked when we received the next electricity bill, it was Nov last year (2012) and the units in the invoice read 3342 for the quarter (Jun-Aug). Whether we actually consumed all of those units was a whole different story which I’m not getting into, but this was enough to open our eyes. The bill triggered a thought process, and there were lot of questions floating. The first and foremost was to find out a way to track how many units we really were using. We did not want to get another similar shock ever again, and I hated to be in the dark about our consumption until we got slapped with the bills. 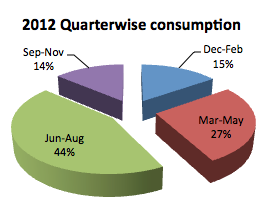 I needed to know our consumption, not weekly, nor daily, but in a real time basis, as and when it happened. So I scouted for solutions and found many, since I’m a communications network guy, one such solution I liked and imported from abroad was cloud based. The solution bridged our electrical and internet broadband lines, and dumped data onto company servers in the cloud. I could now see real time electrical data on the move, all from how many watts my phases are using to historical graphs. This was way better than I expected. It not only served the purpose of tracking my usage, but I could now see deeper, with little tweaking I could now find out which devices are gulping how much energy Vs their ratings. I discovered that we were wasting energy by not switching of appliances when not required, so the very first step was to educate everyone in the family and make them conscious about energy wastage. Our apartment is on the top floor of a G+4 building and west facing, perfect setting for it to act like an oven. It gets extremely hot in the Kolkata climate after noon. I could see our old Clima cool 1.5T Hitachi ACs (two of them) working at 2+ Kwh and I knew this should be my first area of concern. I had to strike it with a double edged sword, I needed to take care of the extreme heating or say thermal sealing of the apartment and retire the 10 year old air conditioners which we assumed to be power efficient. Just a good brand or a popular model does not make the appliance power efficient. Since we did not own the entire building, installation of a thermal seal from inside our home was the most appropriate. So we got Extruded Polystyrene (XPS) boards from Supreme Petrochem installed under deck which took care of the heat coming from the roof. I knew I also had to do something about the west side blazing windows, but I kept it for little later as I had just started with testing the waters and was not too sure about myself as windows were a major cost. We replaced our two old air conditioners with three new ones, 1T+1T+.75T, I was smart this time to understand how effective proper sizing can be. And with thermal seal of U-0.409 (W/sq.m-K) on our roof we could now easily downsize our heating/cooling requirements. We were earlier using 1.5T+1.5T = 3 ton air conditioners units to cool 288 sq ft of space, where as now it was 2.75 tons to cool 395 sq ft, clearly we were cooling more space with less load. When I was selecting our air conditioner units, I did not wanted to go with BEE star rating alone, because in India, anything above COP of 3.1 was 5 star in 2012-13. If you see beyond India, say with Australia/Newzealand (AS/NZ), their highest 6 star AC has a COP of 5, so it was obvious that we needed to think of global standards to match. The best energy efficient units we found in our case were from Panasonic, which had various sensors to save those extra units for us. Having done the roof thermal seal and replaced old air conditioners, we also started replacing old incandescent bulbs with CFLs, LEDs and T5 tubes. We also replaced all of our 75w fans with 43w energy efficient ones. We had put the DTH HD DVR on energy diet, it used to be always powered on, ready to record those serials & seasons, now it was on a scheduler switch, and power cycles based on programs that we need to record. We also took care of exhaust fans in the wash rooms & kitchen, again with a proper sizing we could do with 14w per area of ventilation, we had no ventilation system before. I tweaked the settings of old LCD TVs which brought it consumption down from 180w each to little less than 100w. 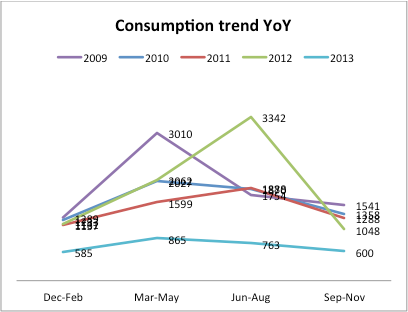 All these measures were taken from the quarter starting Dec 2012, and the 2nd quarter this year really saw a dip in energy consumption as this was the summer season. We were at 1450 units for 2 combined quarters, Dec-May, Vs 3223 units last year. That was a reduction of 55% in terms of units consumed which was a huge encouragement and fuelled my hunger for more. I was not happy with cloud based energy management and 3rd party dependency with my energy data anymore, I wanted my energy data to be formatted exactly as my Utility energy would bill me, telling me how am I doing in my present quarter comparing QoQ. I also did not wanted to keep a 24×7 power hog server in house to track my data, which would defeat the purpose of being green. My childhood experience with coding came in handy, and I somehow managed to write a code which resided on our embedded home broadband router that runs on 5 watts of power and is anyways always on 24×7. This Wifi router now doubles for us as energy management server, keeps the logs into a database, triggers emails to the occupants with reminders when a daily quota of units are exhausted, and respond to email queries with detailed energy analysis, present quarter prediction and past comparisons. This also serves as a proper daily record in case it is required to be presented at a later date for faulty billing claims with the Utility. Reading about all the ways one can save energy, I came across the concept of net zero energy space. This is the concept where the house is not dependant on the Utility anymore for its energy needs and it generates its own energy keeping the Utility as a backup. We loved the idea of being self sufficient with minimum carbon foot print. We no longer wanted to only save energy, but generate it for our own needs; the feeling was like breaking free and standing on our own feet, who does not love it? For the concept to work logically, one needs to lower its energy consumption to a level that can be taken care by greener energy generation technologies, like PV solar. We made this a long term goal, 3 years to be precise. Every year we could use to improve and compare our progress with last year’s data, 2013 being the first year. By the end of 3rd year, the PV panel cost should also come down to an extent giving us energy rates per unit equal to or even lower than the Utility. On our journey to Net Zero, we were looking to strike other energy hogs around. With that we zeroed in on the refrigerator, our old Samsung refrigerator was a frost free 310L model and was taking around 900+ units a year. As with all homes, refrigeration space always keeps going up, so to satisfy our demand, we were looking to increase space and reduce energy consumption. Based on our requirements and present technologies available in the market, we went with a model of Panasonic which was 465 litters DC inverter and was unrated in India. This model was rated 5 stars in Hongkong (HK) and 3 stars in AS/NZ, remember that AS/NZ standards are far stricter. This model should consume less than 450 units a year; I should be able to report exact consumption only after it completes its anniversary next year. It was time to take care of the blazing west side Sun and complete our thermal insulation, it sent me looking for uPVC windows with minimum U-1.7 (W/sq.m-K) of thermal seal and special Low-E glass which had a minimum 4 star rating in Europe. Unfortunately our specifications were Greek to most leading uPVC suppliers, or maybe they were too busy selling junk plastic with glass to people who blindly buy them thinking that will save them energy. When speaking to these companies, their standard response was that their windows save X percentage of energy, no one was willing to explain how, or I should say no one knew how. If one gets little technical in terms of U values or glass specifications, few would either quote you above the roof and rest would not return your calls. The only company I found was willing to work on my specifications reasonably was Lingel. All credits to them for their understanding of the business they are into. I went with Lingel, a German company for my window insulation requirements. Since referring and comparing total unit values does not makes sense with the variable size of living space. Thus all standards refer house energy in terms of kwh per square feet consumed per year (kwh/sq ft/year). 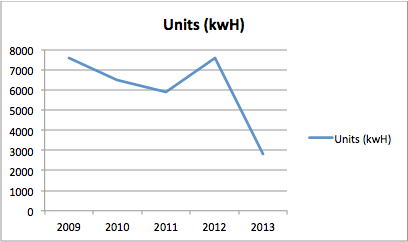 Thus doing the maths, last year (2012) we consumed 8.32 kwh/sq ft, this year (2013) by Dec we should be able to close at 3.08 kwh/sq ft. Even if we don’t take last year as an example since it had that special reckoning quarter, the years before that (2011, 2010) were, 6.46 and 7.09. It was a saving of minimum 58% YoY. I always like to take reference with AS/NZ since them being the stringent of standards, for a place comparable to Kolkata, say Darwin would now rate our house at their highest rating stars. India does not yet have a rating system for energy efficient homes. All that is still not satisfactory, to go solar, we need to be less than 2 Kwh/sq ft/year for the apartment our size, which can then be served using a max 1.4 KWH solar PV system. Else we need to increase our Solar PV system size which does not make any sense. So we are looking to cut down by another 33% over where we stand today. Energy hog appliances that we have retained are the water heaters, LCD TVs, PC, and the PS3 fat, I hope to replace them in the coming years and take up other improvement techniques to bring down the consumption below 2 kwh/sq ft/yr. I wonder how much carbon emissions we can save as a community if each one of us can do our little bits towards energy efficiency. Would it not be an amazing gift we can give our children? The government should also support by encouraging one generate at least 33% of their energy consumption using greener technologies. How about free & priority parking for green cars? All the brands, models and sizes of appliances & materials that we have used may not work for you as it is, since they all need to fit & sized into your requirement properly. We are glad to be able to share the above concept with the readers of bijlibacho.com and Invite readers to get in touch with me at the below mentioned email address for any questions or queries that I can help them with. I’m even professionally willing to help anyone replicate this success story, as a reader to this article, I’ve a win-win proposition for you. If you are willing to take the plunge professionally, get in touch with me, we can work out something without an involvement of an upfront fee! Our journey into green revolution has only begun, and we have taken few steps, there is a long path ahead. We will have some satisfaction only when we are able to achieve net zero energy space. Then there is water conservancy to be thought about, and so on.. Written By: Vineet Bhojnagarwala (vbhoj74@gmail.com) who is a Telecomunications Cabling Consultant by profession and is also very enthusiastic about creating net zero energy spaces.